Yesterday, inbetween the Press View for the Threadneedle Figurative Prize and the evening Preview Party at the Mall Galleries, I sat on the steps in Trafalgar Square, in front of the National Gallery, and sketched the huge screen showing the Olympics and the watching crowd. 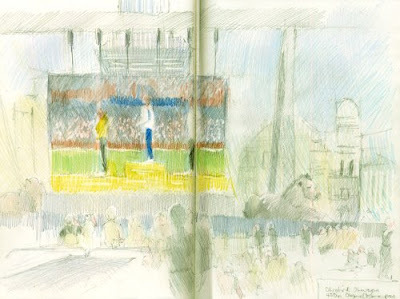 I arrived just as Christine Ohuruogu won her gold medal for Britain in the 400 metres and my sketch is of the medal ceremony. Christine lives in Stratford, right next door to where the 2012 Olympics will be held - which is also a hop skip and rather long jump from where I live in London. I did toy with trying to catch live action - but they were all just too fast for me so I waited until the action slowed up a bit - like when the National Anthem gets played. We didn't all stand but we did clap! There was a very good crowd in Trafalgar Square - all watching the Olympics on the big screen erected at the foot of Nelson's column. The action all takes place with Sir Edwin Landseer's Lions who guard the outside diagonals of Nelson's Column looking most aloof! It began to drizzle so I decided that having missed lunch and due to get home late I'd better go and have a National Gallery Afternoon Tea in the National Dining Rooms which overlook Trafalgar Square. 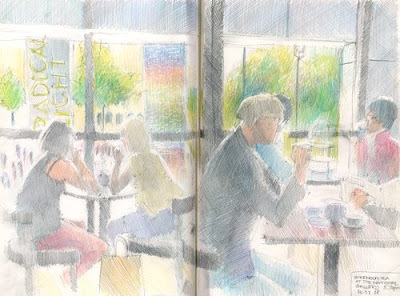 The sketch below is of other people enjoying tea against the light from the windows which overlook the Square. I love sketching people 'contre jour' - you get rim lighting. One of my tips for 'how to sketch people' is to try sketching them against the light so you focus on shapes and can't see any detail, except for outlines. I was rather amused by the fact that the banners hanging down outside are about 'Radical Light' the current exhibition at the gallery. With both sketches I got a bit of colour down when I sketched but added a bit more later to get more coverage. Plus I waited until I could see the photo of the medal ceremony properly before I completed it - having roughed in the shapes and placement while staring at the screen in the Square. I had the Orange Pekoe Tea and sketched slowly so I could enjoy the tea! I did mull over the notion of sketching the Afternoon Tea..........maybe I need to go back? It's official - I know what collectors like to buy! Or rather what the public likes to buy. How do I know? How can I be so confident about my expertise? Why should I be so presumptuous even? Well, I paid my third visit to the Summer Exhibition at the Royal Academy of Arts in Piccadilly on Thursday (which has been open since 9 June - see ) and was rather unnerved as I went round. To some extent it wasn't difficult. 75% of the small figurative/representational paintings in the Small Weston Room have sold (I counted!) - and there's still two weeks to go. (see room guide). I've never been able to understand why the type of art in this room doesn't get more space and why the gargantuan pieces in the large galleries get so much (I'm referring to pieces which cover a large proportion of very large walls!) . I know which art the public likes looking at! The Large Weston Room is always the print gallery of the Exhibition. Virtually all the artist printmakers whose work was hung in there had sold/made sales with some selling very large numbers of limited edition prints. Norman Ackroyd is apparently way out in front in terms of overall on sales. Ackroyd is both a Royal Academician and a Senior Fellow at the Royal College of Arts. On this third visit, I yet again really appreciated the sculpture this year and I hope the approach adopted will be followed again in subsequent years. I also really liked the way the final gallery was devoted to large representational paintings by Academicians and felt this achieved a better balance and pathway between the different types of art shown in the exhibition. 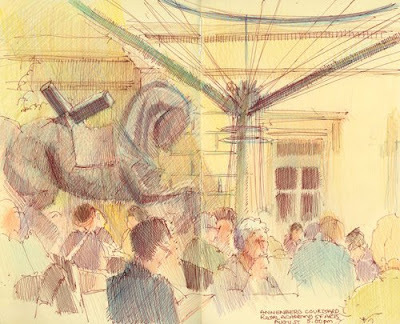 The sketch at the top was done while drinking a cup of tea and sitting under a very large canopy in the Annenberg Courtyard at the front of Burlington House. The horse in the background is a sculpture and one of the exhibits! I really like doing sketches where a group of people only occupy the bottom third of the drawing -you can see more here. The one immediately above was sketched while teetering (see below) on a stool at the Private View on 6th June! 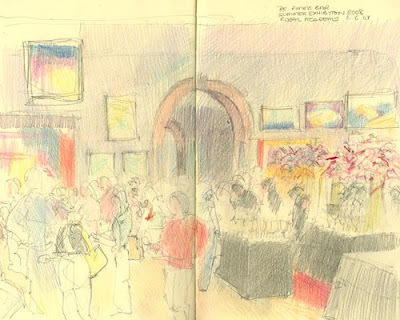 I enjoyed my Private View of the Royal Academy Summer Exhibition on Friday. It was packed as usual and, as usual, I did my annual sketch of the Pimms Bar! This time I did the sketch from some new seating - which was AWFUL. Can I just repeat that - TRULY AWFUL - just in case anybody from the RA is reading. Bar type stools which are inherently unstable are a health and safety risk - and I had to sit very still while sketching this because although the view was very good and I had a table to sit at and put my Pimms on, any sudden movement saw me lurching towards the ground very quickly! I later discovered that the alternative new benches placed in every room were equally badly designed. They made horrendous creaking noises as people sat on them - and I soon discovered this was because they are supporting the weight of 6-8 people with an inadequate design and no support in the middle. I made sure to sit towards the ends and I recommend anybody visiting to do likewise. I did begun to wonder whether the chairs and benches were somebody's idea a performance art installation! Certainly the antics of people responding to the disconcerting nature of the seating were interesting to watch although I could have done without the experiences of 'sitting'. Making A Mark - 8th June 2008: Who's made a mark this week? It felt very weird going to Groombridge Place last week. It has played host to a couple of well known British films. It masqueraded as Longbourn (home of the Bennets) for the 2005 film Pride and Prejudice starring Keira Knightley and was also the star of The Draughtsman's Contract written and directed by Peter Greenaway. There's something very odd about seeing a garden which you've previously only seen on film - particularly when one of those films involved drawing the garden! it is all really an elaboration of the film's original premise which is - should an artist draw what he sees or draw what he knows? Sight and knowledge are not at all the same thing. Seeing and believing. Just because you have eyes does not mean you can see. The eye is lazier than the brain. Because of such contradictions and inadequacies, the draughtsman is framed, and in both meanings of that phrase. And because of the film's ubiquitous optical-device, a frame on an easel, and because of the obsessive framings of the movie-camera itself in making the film, we are framed too. Back in the nineteenth century, Groombridge Place also featured in The Valley of Fear, a Sherlock Holmes mystery by Sir Arthur Conan Doyle who lived not far away in Crowborough. In reality, Groombridge Place reminded me a little of Penhurst Place (see A hot summer's afternoon in a Kentish garden). in terms of the quality of the gardens and its overall presentation. The gardens have the space and potential to be a major attraction but need a lot more thought given to their planting and presentation to lift them out of the 'ordinary' category. 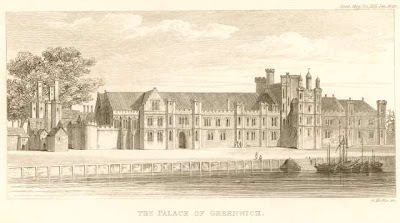 The only aspects of real note are the 12 drum Yews planted either side of the Apostle's Walk - and the house itself which is sadly not open to view. I sat at the top of the steps up to the Bowling Alley and looked down the Apostle's Walk to the side of the house and did a not very good sketch. Yet again this is a garden where I came away with a feeling that nobody has ever sat on the benches in the garden to see whether they had a 'view' or not. Sadly most did not! Personally I'd have had a handout with thumbnails of the Draughtsman Contract drawings and then a map of all the locations and where they were drawn from - but then I like looking at maps! The Place is run independently and seems to have given itself over to trying to attract lots of families with children - hence a rather expensive ticket price for a whole range of 'attractions' (the Enchanted Forest) which I had no interest in seeing. One of the things I like about gardens is the peace and quiet - entertainment for adults if you like! When I'm visiting a garden what I'm particularly not interested in hearing is lots of small children all charging around said garden at top speed wanting to know where the (in this case) the maze and the dinosaurs are, especially when these are in a distant and separate part of the grounds! I really don't know why they don't have a separate entrance for the gardens and reduce the price for those who only want to visit the gardens. As it is, given the way the ticket is priced for all the additional attractions, our outing last week will be the first and last time we will be visiting Groombridge Place! I shall stick to my copy of The Draughtsman's contract described in the IMDB as a "Rich, tart and amusing art-house thriller". Groombridge Place - formal gardens and filming of Pride and Prejudice. I'm developing a series of information sites related to the English gardens I visit from time to time with my sketchbook. 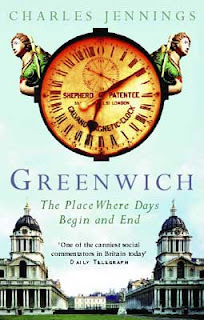 As regular readers will know I like to provide information about the places I visit so that others can find out more about it if they want to and also to visit - either on a virtual basis or in reality. Consequently, I usually end each blog post with a set of links related to the place I visit. In future, what I'm hoping to have is one link to the garden website and one link to my information website for that garden. I've started with two of my favourite gardens - Sissinghurst and Great Dixter. 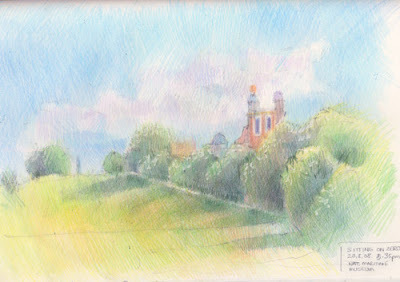 Each site will all the relevant blog posts from Travels with a Sketchbook and some of the sketches in the sites I create. At the moment I've got both sites off the ground but I need to develop them so if you;re interested, I'd suggest that you also check back at a later date to see how they're doing. The main area of development are modules devoted to each 'room' within each garden. I've got some done but need to do more. I'll also be adding in a note for artists - about what they're like for sketching and a plan of the places I've sat to sketch - which you will see on this blog first. I'd be delighted to receive suggestions from readers about relevant content. I know that a lot of my readers also like gardening so I hope you enjoy the pictures, the information and the gardening books - and the blog posts about the garden by gardening bloggers!